The source code in this repository reflects the app which supports mobile devices running Android 5.0+. This app is inspired by PackageTracker which is developed by fython and has a lot of similar elements in design and function with it. Thanks for the contributions of fython and his team. Over than 640 express companies all over the world are supported. Support add packages by inputting the package number manually or just scanning the express sheet. Support recognize the company of a package automatically. Support view the package's details such as the latest location. Support search packages that you added and the information about the express companies. Day mode and night mode are supported. Support push notification when the package is refreshed. Support send feedback on using experience from your devices. I hope the source code for this app is useful for you as a reference or starting point for creating your own app. Here is some instructions to help you better build and run the code in Android Studio. Notice: If you want to review a different branch, replace the master with the name you want to checkout (if it does exist). Finally open the Espresso/ directory in Android Studio. Suggestion: It is better for you to update your Android Studio to version 2.3 when you open this project. This project is still in progress. Here are the some features that I will finish in the future. [x] Refreshing package details by accessing the network. [x] App Shortcuts on devices that running Android 7.1+. [x] Material design app onboard pages. [x] Alphabet indexing for companies list. [x] Search packages and companies. [x] Day and night mode. [x] Service to build notifications. [x] Settings and about page. [ ] UI test and unit test. As you can see at the screenshots, some images in Espresso app are not suitable. So if you are a designer and familiar with Material Design and want to help me make the app look better, please email me. If you want to improve the translation of Espresso, do not hesitate to email me. Let us make Espresso more and more popular all over the world. 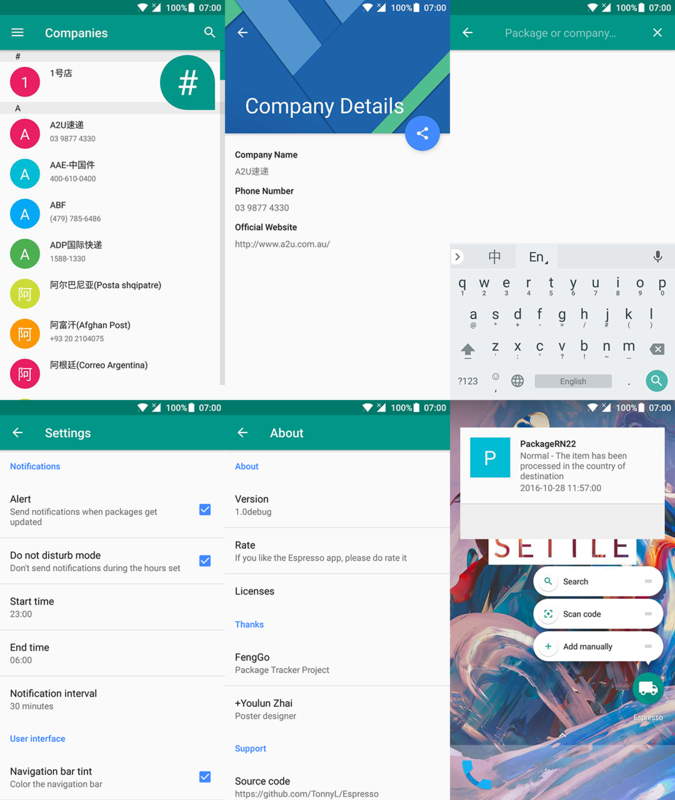 googlesamples - android-architecture:A collection of samples to discuss and showcase different architectural tools and patterns for Android apps. google - iosched:The Google I/O 2016 Android App. 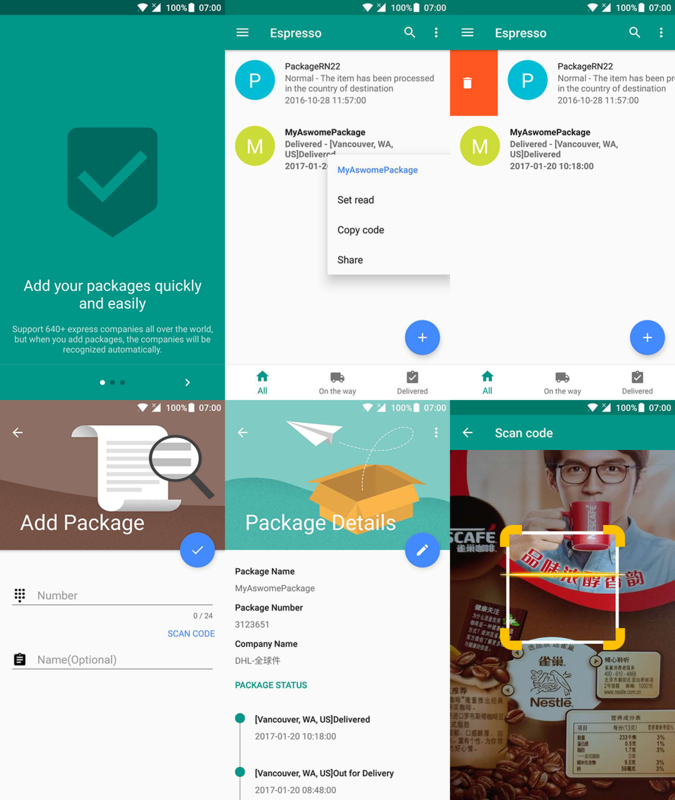 fython - PackageTracker:The New ExpressHelper for Android. hefuyicoder - ListenerMusicPlayer:A Grace Material Design Music Player. Other people who help me solve the problems when I met some difficult bugs.